Lesley Gore said that it was her party and she could cry if she wanted to. Her Dotyness says that this is my blog and I’ll whine if I want to. I have a spring cold. 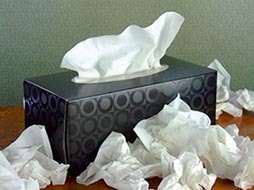 My nose hurts, my sinuses are exploding, my eyes burn, my ears hurt, my lungs stick together when I cough, my lips are chapped, I sound like an off-key seal, and I spent half the night in the restroom since I’m getting to the age where sneezing with an even marginally full bladder is a game of Russian roulette. I’m miserable. And I’m being a great, big, giant baby about it. After working all night, I stopped on the way home for some sick food – soup, sherbet, crackers, that sort of thing. Sherbet isn’t on the Whole Foods Plant Based menu, but I made an executive call after listening to myself whine all night long. On the menu or not, orange sherbet went into the buggy. Now, I’ve never been a big fan of chicken noodle soup – except when I’m sick. Then, that’s pretty much all I want. But, there’s not really a vegetarian version of it. Cruising the soup aisle for inspiration, I found that there were very few vegetarian soup options at all. Even many of the vegetable soups had either a chicken or beef stock base. I was SO not in the mood to discover this. I ended up with some green pea soup and some tomato soup, neither of which was what I really wanted; but they’ll do in a pinch. They’re warm and comforting, which is what I was after anyway. When I finish my soup, I’ll change into my sweats and pink, fuzzy robe, eat a little sherbet, then put my annoying self to bed. As I continue to eat nutritionally dense foods, my hope is that these colds become fewer and further between. Years between works for me. I am so feeling you! Have been on several rounds of anitbiotics and went back to the doctor yesterday and he gave me a shot! Ready for this to go AWAY and stay AWAY! Ima have to cook some of that up and keep it in the freezer, Mary Katherine. I’m sure it would also taste a whole lot better than that stuff did out of the can! I knew it wasn’t allergies! And you’re a great writer!! And here I was, working under the obvious impression that you were merely a blazened-haired, well-equipped, bipedal distraction! But I WANTED it to be allergies! I still do, but I can only be so delusional before I start giggling. Thank you and I’m glad so see that my mild-mannered, alter-ego disguise worked!